Healing herbs have played a part in both traditional and non-traditional forms of medicine dating back at least 5000 years. They have been used by physicians and healers of various cultures and civilizations throughout time to soothe the nervous system and protect the body from stress and anxiety. 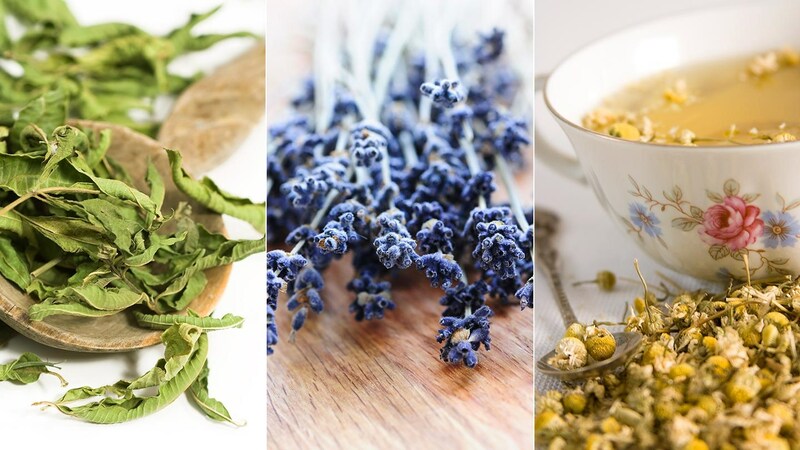 Whether you have a full-blown anxiety disorder or just fleeting moments of unease, you might benefit from experimenting with calming herbs — taken either as a supplement, consumed in tea, or used in aromatherapy. In the last few months, I have combined a few of the herbs below in my tea when my anxiety peaks throughout the day and also as a sleep aid before I go to bed at night. I am not advocating that you use herbs to replace anxiety medication. However, they can be a nice supplement to what you’re already taking. For mild symptoms, they may be all you need. As always, please consult with your doctor to make sure they don’t interfere with any medications and are safe for you to use. Chamomile (Matricaria recutita) is one of the most ancient medicinal herbs and is used to treat a variety of human ailments such as hay fever, inflammation, muscle spasms, menstrual disorders, insomnia, ulcers, wounds, gastrointestinal disorders, rheumatic pain, and hemorrhoids. Widely regarded as a mild tranquillizer and sleep-inducer, its sedative effects may be due to the flavonoid, apigenin that binds to benzodiazepine receptors in the brain. Chamomile extracts exhibit benzodiazepine-like hypnotic activity as evidenced in a study with sleep-disturbed rats. In a study at the University of Pennsylvania Medical Center in Philadelphia, patients with generalized anxiety disorder (GAD) who took chamomile supplements for eight weeks had a significant decrease in anxiety symptoms compared to the patients taking placebos. Chamomile is used extensively in cosmetics and aromatherapy and is popular in the form of herbal tea — more than one million cups per day are consumed! Lavender (Lavandula angustifolia or Lavandula officinalis), which is known for its beautiful fragrance, has been used as a remedy for a range of ailments from insomnia and fatigue to depression and anxiety. The name lavender comes from the Latin root lavare, which means “to wash,” possibly named for its popular use in baths—an ingredient in soaps and shampoos–to help purify the body and spirit. In a 2010 double-blind randomized study, lavender was shown to reduce anxiety symptoms in people with generalized anxiety disorder (GAD) as effectively as lorazepam (Ativan). In another study, the use of lavender essential oil helped reduce test-taking anxiety among graduate nursing students. Native Americans are the first people known to use passionflower (Passiflora incarnate or “maypop”) for medicinal purposes. It was originally used primarily to treat the conditions of “restlessness” or “hysteria;” settlers across America spread its use as a sedative. Researchers believe passionflower works by increasing levels of gamma aminobutyric acid (GABA) in the brain, which lowers the activity of some brain cells and makes you feel more relaxed. In one study published by in the Journal of Clinical Pharmacy and Therapeutics, passionflower was as effective as the drug oxazepam (Serax) for treating symptoms of anxiety in people with generalized anxiety disorder (GAD). While it didn’t work as quickly as oxazepam, it produced less impairment on job performance than the drug. Another study showed that patients who were given passionflower before surgery had less anxiety than those given a placebo, but they recovered from anesthesia just as quickly. Lemon balms (Melissa officinalis) is a member of the mint family and has been used as far back as the Middle Ages to combat stress and anxiety, promote sleep, and improve digestion. Used with other calming herbs, studies show that it can be an effective sedative, soothing anxiety and aiding sleep. In a double-blind, placebo-controlled study, 18 healthy volunteers received two separate single doses of a standardized lemon balm extract (300 mg and 600 mg) or placebo for seven days. The 600 mg dose of lemon balm increased mood and significantly increased calmness and alertness. Another study documented the effectiveness of a lemon balm along with other herbal preparations to reduce anxiety. When the participants used the lozenges, they demonstrated marked increases in alpha wave activities that are associated with relaxation. Valerian (Valeriana officinalis) has been used since the second century to treat insomnia and anxiety, although it became popular in Europe during the 17thcentury. Scientists believe that, like other calming herbs, valerian increases the amount of gamma aminobutyric acid (GABA) in the brain, similar to drugs like alprazolam (Xanax) and diazepam (Valium) which relaxes the brain. The studies on Valerian as a sleep aid are inconclusive. In one study, Valerian was not shown to be appreciably better than placebo in promoting sleep or sleep-related factors for any individual patient or for all patients as a group. However, in another randomized, double-blind study, 75 participants with documented insomnia received either 600 mg. of valerian extract or 10 mg. of oxazepam for 28 days. Those who took Valerian had the same improvement in sleep with fewer side effects as the oxazepam group.